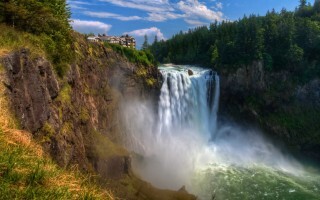 Located 25 miles east of Seattle, Snoqualmie is best known for Snoqualmie Falls and its railroad history. While city government focuses on preserving Snoqualmie's small-town character, it also promotes a live, work, play environment supportive of established and new residents and business owners. While many residents live in downtown Snoqualmie, which is the heart of the original town, the majority live in the new master-planned community of Snoqualmie Ridge. Homeowners enjoy the stunning natural beauty of more than 1,343 acres of the Upper Snoqualmie Valley. Over 40 percent of this new community has been set aside as open space, including amazing parks and trails, preserved wetlands and a Jack Nicklaus Signature TPC Golf Course. This community features a mixed development of signature homes, townhomes, condominiums, and apartments built by some of the Pacific Northwest's preeminent builders. Snoqualmie is the State's fastest growing city. Residents of Snoqualmie enjoy restaurants, stores, professional services, a new library, and an excellent school district. In 2009, a new city hall opened in the historic district where significant revitalization and economic development projects are underway. The new Snoqualmie Casino is close to downtown as well. Right in the heart of the Mountains to Sound Greenway, Snoqualmie offers an abundance of outdoor recreation. The city has 34 parks ranging from play-grounds to athletic fields and offers many sports programs for kids. Many special events occur throughout the year such as the Railroad Days Festival and the Boeing Classic at the Snoqualmie Ridge Tournament Players Club Golf Course. The Snoqualmie Valley is home to Snoqualmie Falls, one of the most visited and breathtaking natural wonders in Washington State. The 270-foot cascading waterfall is located within minutes of historic downtown Snoqualmie. Combine this with easy access to outdoor activities such as Mt. Si, the Snoqualmie Pass Ski Resort, Snoqualmie National Forest, and Alpine Lakes Wilderness and you have one of Washington's favorite outdoor playgrounds.